The highly integrated MAX36010 and MAX36011 single-chip security supervisors from Maxim Integrated Products offer security solutions to make it easier for designers to execute robust tamper detection, cryptography and secure storage while protecting sensitive information via logical and physical protections, with no need to be security experts themselves. The devices both provide strong security that can be simply integrated into a design at any stage of its development. Also, if these parts are combined later in the design cycle, there is no need to modify the platform to accommodate them, thereby simplifying the implementation process. Compared to competitive solutions, it is possible to facilitate a 60% faster design cycle, while also reducing BOM costs by 20%. To assure a higher level of security, these supervisors generate keys via a TRNG. The keys are then deposited in battery-backed RAM along with certificates and other sensitive data. 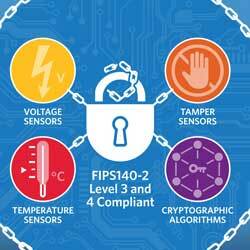 This data is deleted when tampering is detected, an ability that meets the requirements of FIPS Publication 140-2 at its highest security levels (Levels 3 and 4).